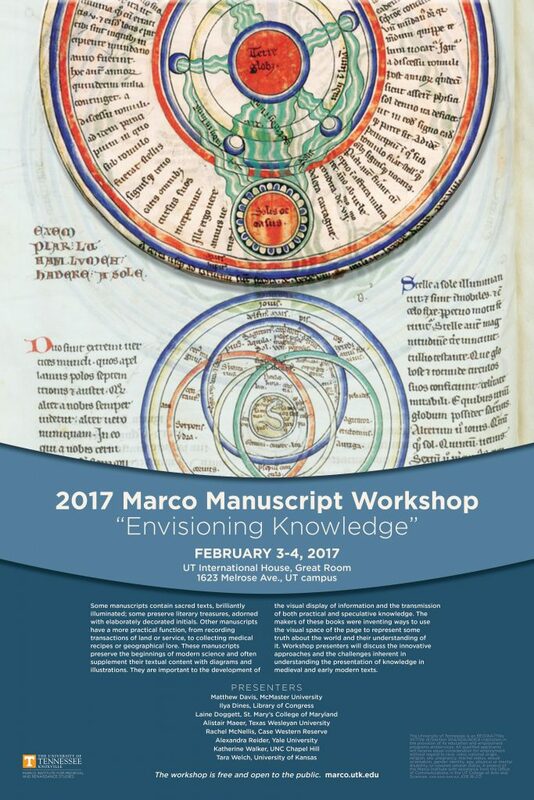 The Twelfth Annual Marco Manuscript Workshop will take place Friday and Saturday, February 3-4, 2017, in the Great Room of the International House (1623 Melrose Ave.) at the University of Tennessee – Knoxville. The 2017 Manuscript Workshop, organized by UT professors Maura K. Lafferty (Classics) and Roy M. Liuzza (English), explores the idea of “Envisioning Knowledge.” Some manuscripts contain sacred texts, brilliantly illuminated; some preserve literary treasures, adorned with elaborately decorated initials. Other manuscripts have a more practical function, from recording transactions of land or service, to collecting medical recipes or geographical lore, to marking days and years, to charting the scope of the earth or the course of the heavens. These manuscripts may have a more utilitarian appearance, but they often supplement their textual content with diagrams and illustrations, charts and maps, tables and lists. Such manuscripts preserve the beginnings of modern science, and they are important to the development of the visual display of information and the transmission of both practical and speculative knowledge. The makers of these books were inventing ways to use the visual space of the page to represent, in one way or another, some truth about the world and their understanding of it. This year’s presentations will focus on these ideas, considering the challenges inherent in–and innovative approaches to–understanding the presentation of knowledge in medieval and early modern texts. Click here to see the full program. The workshop is open at no cost to scholars and students who are interested in sharing a lively weekend of discussion and ideas about manuscript studies. Information on guest parking at UTK is can be found at: http://parking.utk.edu/permits/#visitors. There is a lot of construction taking place on and around campus right now (including near-daily changes in road closures), so you may want to give yourself a little extra time to find your way around. Email marco@utk.edu for more information.